4 mins read	March – A geek’s gotta get ready: The leprechauns are here! March – A geek’s gotta get ready: The leprechauns are here! Coincidentally enough the Leprechaun series is due to be re-booted (sometime) this year with Leprechaun: Origins. That thing is a leprechaun and we’ve gotta find a way to stop it! Leprechaun (1993) – The Leprechaun goes on a murderous rampage to retrieve his pot of gold. Leprechaun 2 (1994) – The Leprechaun seeks out a new bride in modern day Los Angeles. Leprechaun 3 (1995) – The Leprechaun goes on a rampage… in Las Vegas. Leprechaun 4: In Space (1997) – Set in the future, the Leprechaun abducts and attempts to woo an alien princess. Leprechaun: In the Hood (2000) – A pimp steals the Leprechaun’s magic flute that gives him the power to be a successful music producer, the Leprechaun spends most of the time killing everyone to get his flute back. Leprechaun: Back 2 tha Hood (2003) – The Leprechaun goes back to the original story of simply trying to get his gold back, only this time there are significantly more drug dealers and bullets laced with marijuana. 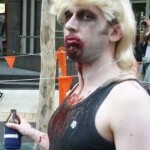 The title picture attached to this post is a screen shot from Leprechaun 4: In Space. Yes, it’s a rip off of a lightsaber – though it’s more of a light-pogo-stick. 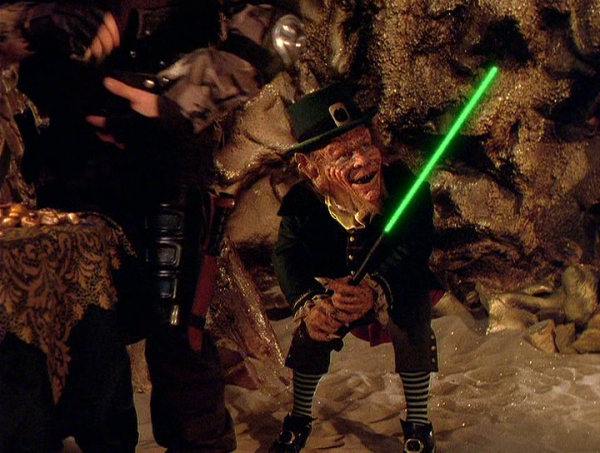 Since Warwick Davis who plays the Leprechaun in the first 5 movies of the series has a long association with Star Wars, it’s an acceptable rip off. In fact, Star Wars: Return of the Jedi was Warwick’s big break – at only 12 years old he was cast in the role of Wicket, along with a lot of other little people to play the Ewoks. While Warwick’s portrayal of Wicket was spot on in terms of the required role of token cute furry thing that will appeal to children, many of the fans never really liked the Ewoks – probably because George Lucas likes to upset fans. After suffering through two Ewok-inspired telemovie spin-offs, Warwick Davis was rewarded with the lead role in Willow, >which remains a cult classic, but still sadly unusual film in that it cast dwarf actors as major characters. It’s also one of the few films where Warwick Davis didn’t have to wear heavy makeup and/or prosthetic on his face for a change. In fact, Warwick Davis is probably THE most successful little person in the history of film and TV – you’ve probably seen him numerous times, but haven’t necessarily noticed since like most little people in film and TV, he is often in costume. Aside from Leprechaun, Return of the Jedi, and Willow, Warwick has also been in The Phantom Menace (and was even Yoda’s body double in the other prequels), as well as the Harry Potter series (Professor Flitwick and Griphook) and the Chronicles of Narnia (Nikabrik), along with just about every other movie you can think of that had the need of a little person cast. Warwick was even the “legs” of Marvin the Paranoid Android in Hitchhiker’s Guide to the Galaxy (voiced by Alan Rickman). The only rival Warwick Davis has in most successful little person is Peter Dinklage, best known as Tyrion Lannister on Game of Thrones – who coincidentally enough was also cast in the Chronicles of Narnia (Trumpkin). Did you miss Get Over It Day? Get Over it!